The first part of this entry really contains most of the story. The rest of the time was pretty uneventful although I did see some other cool stuff so I'll share some of that now. 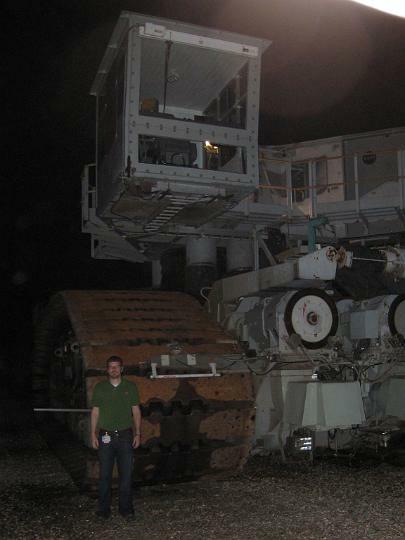 When we went out to the launch pad to work, the Crawler was at one of our stops so I got a picture next to it (below). Unfortunately, it was dark so I didn't get any really good pictures but you can see how huge it is. Speaking of huge, I took some pictures of the Vehicle Assembly Building (VAB) with some workers on it to give a sense of scale. You can see the series of pictures in the album or on Zooomr. Zooomr lets you add 'portals' on pictures so that when you hover over or click on a part of the image, you see the more detailed image. Sorry IE users, I couldn't get it to work in IE earlier but maybe you'll have more luck. The other place I did some work this time was the Space Station Processing Facility (SSPF). This is where Station components are stored and worked on before being launched. There are pictures of most of the components in the album. Elizabeth was most interested in Columbus because she is the lead for her group for that flight. 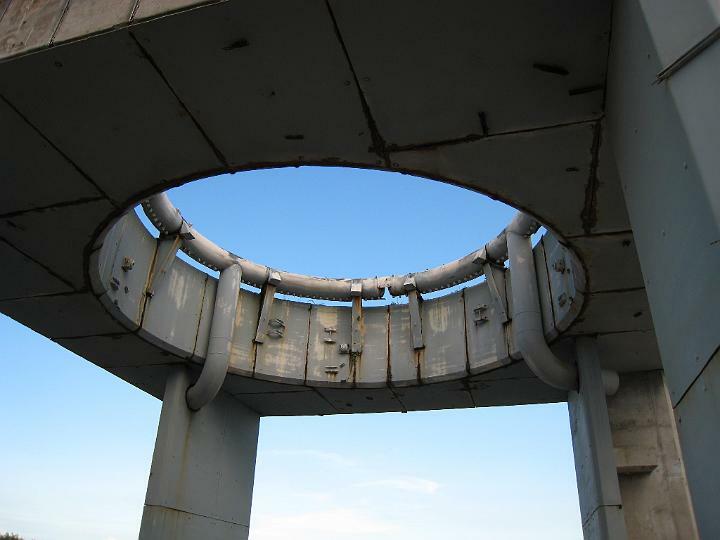 Lastly, Andrew and I were led to the Mercury launch pad where John Glenn became the first American to orbit the earth. Again it wasn't in great shape, but there were some cool monuments like the one below and the astronauts' parking spots are still there. I also put the pictures of the Mercury Monument on Zooomr with the same click zoom coolness! Over the last 2 weeks, I've made 2 more trips out to Kennedy Space Center in Florida. These trips were much more relaxed than my last one so I got to do some more sight seeing. I've updated the KSC album with a bunch of pictures from the trips. The first trip included some work at the launch pad again and both trips included some work at the Space Station Processing Facility so there are pictures from both of these places. 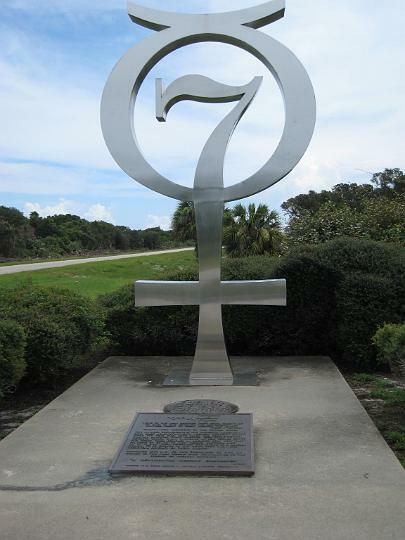 However, I think the coolest part of my trips was driving around the Cape Canaveral Air Force Base to see some of the old spaceflight memorabilia. Andrew, my coworker and friend, and I decided to go see the Apollo I launch pad, where three astronauts tragically lost their lives in 1967. However, neither of us knew where it was and there were no signs pointing us in the right direction so we ended up on an interesting journey around the base. First, we visited a missile and space museum that a sign led us to. It was interesting, especially the fact that it was open but no one was there and the lights were off. I guess you can do that when badges are required just to get to it. We turned the lights on and had a look around (there are quite a few pictures in the album). Next, we stumbled upon the old lighthouse and a couple of Delta rockets on their launch pads (pic). At this point we had driven quite a bit and needed to go to the space center for some work. We continued our quest the next day with some vague guidance. We ended up at a back entrance to the Shuttle Pad and also passed "The Beach House" which is one of the places crews hang out before launches. The guard at the Pad gate gave us some more directions and we eventually stumbled upon the Apollo I Pad. In fact, we realized after we got there that there was a direct route that ended on the complete opposite side of the pad. I thought our meandering was so funny that I made a Google My Map documenting the journey (I know I'm a nerd). Last Saturday we went to our friends', Dave and Lauren's, wedding. They are an awesome couple, and we are so excited for them. Their wedding was so much fun! Lots of dancing and laughing. Unfortunately I forgot to charge my camera battery, so I only got a few pictures. Sunday was my birthday..the big 28. Ross gave me a trip to a local spa. I can't wait! I also got to do some shopping, which was fun. It reminded me of my b-day in Paris last year...shopping with Ashley and one of her friends. Ross had to go to Kennedy Space Center for the week, but we got to hang out most of the day. Then I went out for dinner with some friends where I got to have one of my favorite desserts...a pizookie, which is basically a deep dish (like a pizza..thus the piz) chocolate chip cookie with vanilla bean ice cream on top! 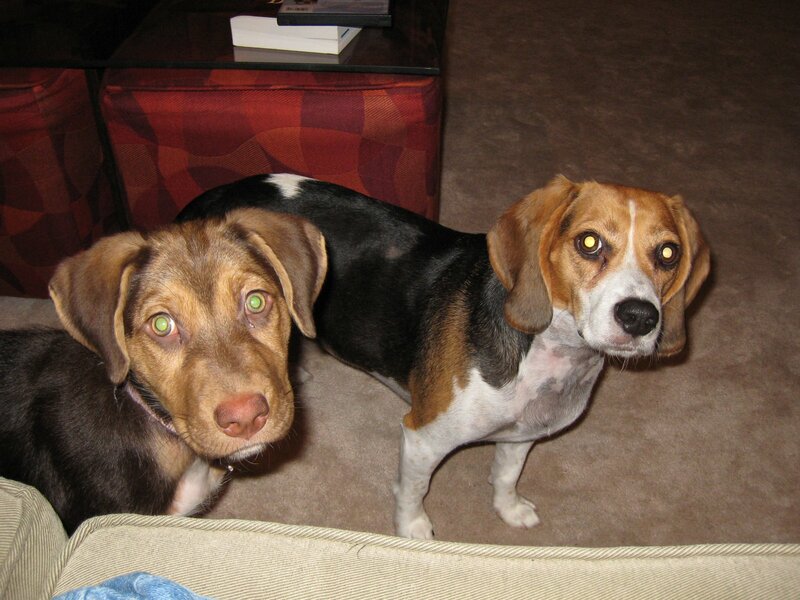 Our friends, Jenny and Brandon, brought their new puppy, Lucy, over to meet Bailey. They were cute together. 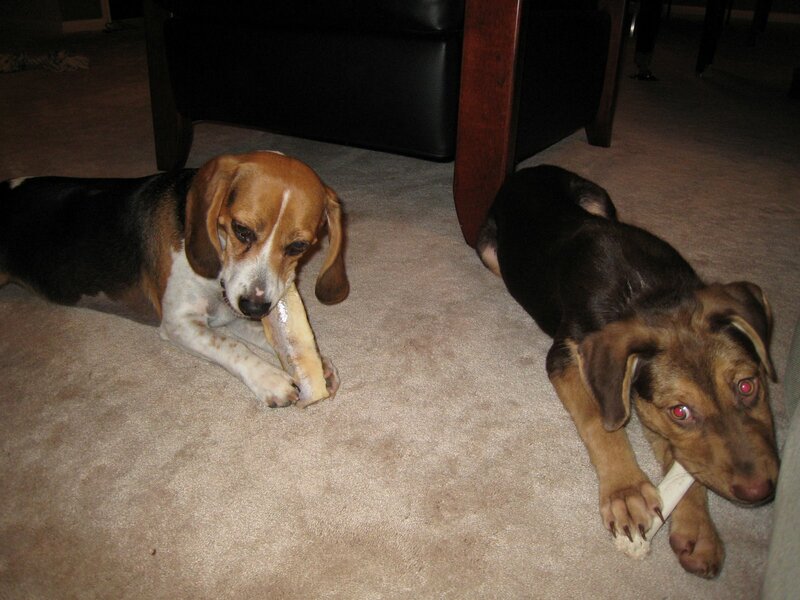 They ran around chasing each other and learned to share bones. Bailey is definitely showing her age though. She can't keep up as well and tires more quickly, and if you know Bailey, that means she gets grouchy! Here are a couple of pics of the two together. It's been raining here so much and there has been so little time between rains that there is algae growing in the streets. I just got back from a walk with Bailey and all over the neighborhood, in the puddles by the curbs, there is algae growing. We went to one of our favorite spots this weekend, Leakey, TX. Ross has family there, and we always love spending time with them in such a beautiful relaxing place. Leakey is in the hill country of Texas, and they've had a lot of rain this spring which is great for several reasons, but mostly because it means the Frio River is higher, which makes for better kayaking and tubing! We spent 5 hours kayaking with Ross' sister, Leslie, and her husband, Philip, on Saturday. Both Ross and I ended up sunburned despite lots of sunscreen, so we didn't go tubing with everyone on Sunday. We did get some pictures of everyone getting in their tubes and heading down stream. While they were floating, we spent some time riding around on the ranch and visiting with Ross' parents. It was a great trip, and I wasn't ready to leave!